Qi-Gong is a system of exercises for cultivation of Qi. (Qi) can be translated as energy and (Gong) as practice. There are many more such types and each in turn has a large number of different variations. 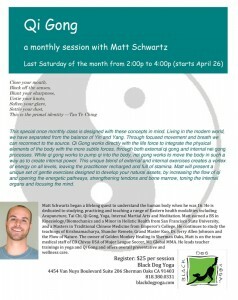 One analogy would be to think of Qi as music and the different types of Qi-Gong as different musical instruments. The subject matter is the same but the way it is approached can vary. The Internal Martial Arts themselves are a type of Qi-Gong. Internal Arts: All of the internal martial arts rely for their effectiveness on internal power – the power cultivated by the alignment and coordination of the whole body and will. Essentially martial in nature, these arts are practiced by most people for their health-giving properties rather than just for self-defense.